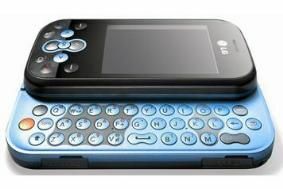 LG mobile has QWERTY keyboard for easy texting | What Hi-Fi? With the KS360's slider keypad, users can write messages "quickly and accurately", according to LG. To make messaging even simpler, once the keypad has been pulled out, the 2.4in screen automatically rotates 90 degrees using accelerometer technology. The tri-band phone is also equipped with a 2MP fixed focus camera, a MicroSD card slot which can take cards up to 4GB for storing your digital media files, Bluetooth 2.0, WAP 2.0 browser and EDGE compatibility. It can handle MP3, AAC, AAC+, eAAC+ music files and MPEG4/H.263 video, as well as SMS messaging, web browsing and email. The LG KS360 is available in titanium and bright blue, white and pink, black and red or black and silver.